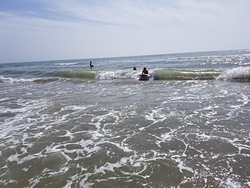 South Padre Island in Texas is an exposed beach/Jetty break that does not work very often. The best conditions for surfing are during the hurricane season. 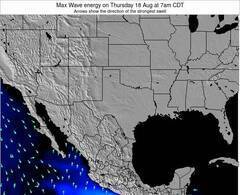 Offshore winds blow from the west. Most of the surf comes fis in the form of windswells and the ideal wave direction is from the east southeast. The beach break provides left and right handers. Good surf at all stages of the tide. Sometimes crowded. Hazards include rips, obstacles, sharks and jellyfish. Para Port Mansfield Jetty, a 9 km de South Padre Island. At BUOY-PMNT2, 17 km from South Padre Island. The closest passenger airport to South Padre Island is Valley International (Harlingen) Airport (HRL) in USA, 61 km (38 miles) away (directly). The second nearest airport to South Padre Island is Brownsville South Padre Island International Airport (BRO), also in USA, 86 km (53 miles) away. Third is General Servando Canales International (Matamoros) Airport (MAM) in Mexico, 102 km (63 miles) away. Kingsville Nas Airport (NQI) in USA is 107 km (66 miles) away. Mc Allen Miller International (Mcallen) Airport (MFE), also in USA is the fifth nearest airport to South Padre Island and is 109 km (68 miles) away.